The Rev. Susan Newman Moore. It felt like a typical Sunday at the “diverse, spirit-growing, justice-seeking” church. That is the motto of All Souls Church Unitarian in Washington, one of the most respected and most multiracial congregations in a denomination where those two attributes are strongly linked. The program that congregants received that day noted a workshop to support Latin American youth and intensive training on race and ethnicity. There was a request for volunteers to fix up the room named after the late black pastor David Eaton, who led All Souls in the ‘70s to being one of the first racially inclusive churches in the country. Then, directly after services, dozens of people gathered in the church basement for an intense meeting about the nature of racism. But the focus this time was All Souls itself, its board and its longtime, white male pastor. The messy, bitter and unexplained exit weeks before of the Rev. Susan Newman Moore, a 60-year-old African American who had been All Souls’ associate minister for more than seven years, had deeply unsettled the 1,100-member congregation. The conflict at the church reflects a modern debate about racism, which often surfaces in less overt ways that can be open to interpretation. At liberal institutions such as All Souls, a longtime bastion of progressive values and activism, racial conflicts can also raise suspicions of hypocrisy. Several liberal religious denominations are wrestling with racism allegations. The Unitarian Universalist Association in the past year has been asked to help resolve 15 congregational conflicts involving religious professionals of color, and Metropolitan Community Churches faced allegations of racism after a dispute and separation earlier this year with a black female pastor. In Moore’s case, her supporters assert that the issue is not whether she is blameless but whether she, as a black female pastor, is being more harshly judged for her flaws and mistakes than the white male pastor, Senior Minister Rob Hardies, is for his. In other words, are Hardies and Moore receiving equal benefit of the doubt? Even at the basement meeting, where some 40 people gathered to create a case for a better financial settlement for Moore, there were competing perspectives. Some wanted to tamp down the confrontation, while others advocated engaging it for the good of the church. Many interviewed for this report requested that their names not be published out of concern that their remarks would offend some people. “We all want to be a beloved community. But if we just make accusations [of racism], no one will want to listen to us,” a middle-aged white man said from a folding chair on one side of a large circle. It’s exactly the kind of racism Moore and her supporters are alleging she experienced. As the only African American on the full-time professional religious staff, Moore alleges that she was underpaid, shortchanged on vacation and received just one evaluation - a positive one - during her seven years at All Souls. She alleges that she was the target of years of micro-aggressions - racially motivated slights - by congregants who called her by her first name despite her request they use her title and by church staff who she said did not show the same respect for her authority, particularly when Hardies was on sabbatical and she was in charge, that they accorded to Hardies automatically because of his gender and race. Several congregants who served in leadership roles said complaints about Hardies’ management - mostly that he ignored or avoided conflict - were long-standing. An additional staffer was added to the management team to make up for that, said Karen King, who served on the church council’s steering committee for five years and was privy to the hiring conversations. Despite this, Moore says, she is being punished while his career remains intact. The Rev. 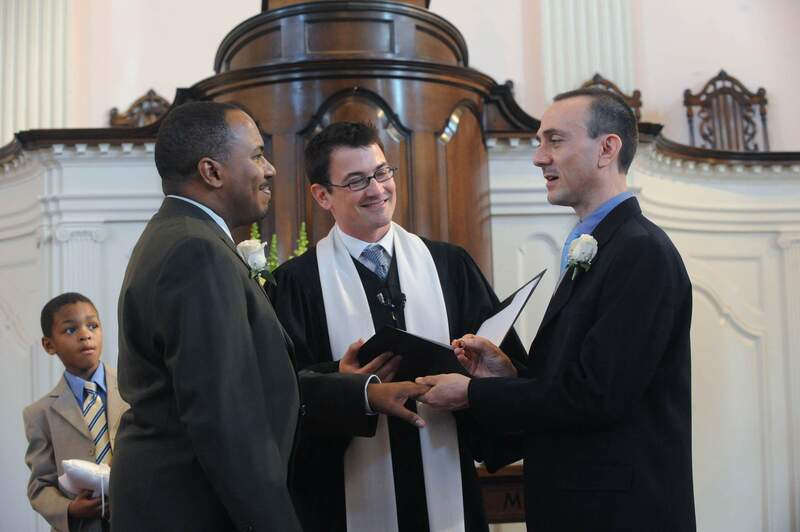 Rob Hardies officiating at a wedding in 2010 at All Souls Church in Washington. While Moore resigned rather than accepting a suspension, she maintains that she was essentially forced out, by All Souls leadership and the regional leadership of the United Church of Christ, the denomination that ordained her in the early 1980s. Hardies and board President Thurman Rhodes, an African American judge in Prince George’s County, Maryland, denied Moore’s allegations but declined to comment on the reasons for her suspension, citing the need to protect the confidentiality of the UCC process and their own church personnel. The church later released a statement to The Post saying Moore’s pay was in compliance with the contract she negotiated and signed. “I believe All Souls is a deeply committed anti-racist institution. Having said that, it’s not immune” from racism in general, he told The Post. Tyndall later wrote a series of letters to church and denominational leaders at the Unitarian Universalist Association and UCC in which he complained about Moore and Hardies, citing everything from what he saw as the pair’s excessive vacation and sabbatical schedules to their inattentiveness to church matters. He also alleged Moore had plagiarized parts of sermons, among other things. He cited several instances in which Moore’s writing mirrored that of others, including in sermons and in her personal statement when she was hired. A couple of examples involved passages from Wikipedia, which Moore says is “fair use.” She also noted the influence others had on the Rev. Martin Luther King Jr.’s “I Have a Dream” speech. In a letter dated Sept. 8, Chuck Dulaney, who was then the board president at the church, told Tyndall his complaints were “hurtful” and to back off. Hardies and Moore “are important leaders of our beloved community,” Dulaney wrote. Tyndall then shared his allegations with the United Church of Christ, which launched a broader investigation that lasted months. All Souls staff members, including Hardies, were interviewed as part of the probe. In mid-February, the UCC suspended Moore from the ministry for six to 12 months while she worked on a “growth” plan. The two UCC minister-investigators in the case - both African Americans - declined to give the congregation or The Post details of why they found Moore unfit for ministry, and whether their reasoning included Tyndall’s complaints or was entirely separate. Hardies, board members and UCC investigators won’t share details about their reaction to the initial congregant complaint, nor about subsequent interviews with All Souls’ staff. The UUA, which includes All Souls but did not ordain Moore, had initially declined to become involved but said in a statement that it is trying to help both sides reach a resolution. 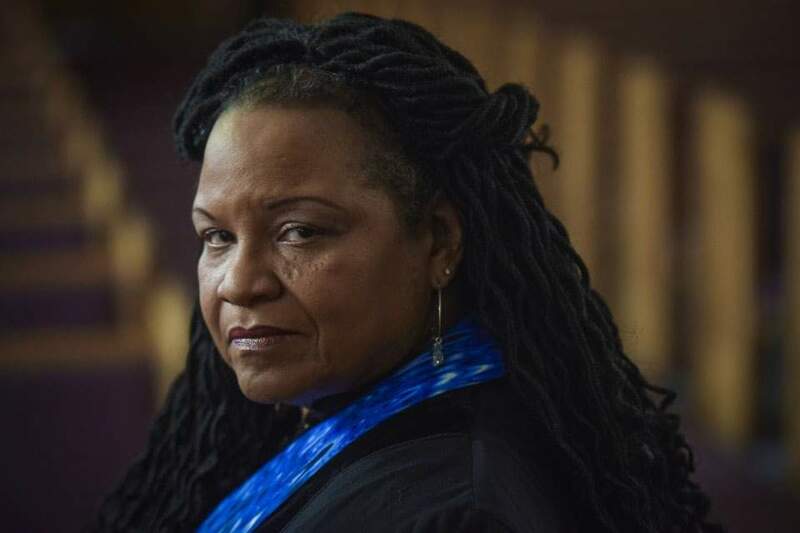 A few days after her exit was announced at the end of January, Moore did an hour-long video interview with Black Lives of Unitarian Universalism (BLUU), a group meant to support African Americans in the overwhelmingly white denomination. She made the video, she said, to defend her reputation. Moore said that when UCC investigators laid out their allegations, they were not the ones Tyndall had originally raised. Instead, she said, they included not being a supportive colleague, violating confidences while the probe was ongoing and ministering to an All Souls congregant while on leave. Neither the UCC nor All Souls’ leaders would confirm this. After nearly 200 years on the social justice forefront leading on everything from fighting slavery and segregation to legalizing same-gender marriage, All Souls’ attendance surged after the election of President Donald Trump. Now some congregants say they feel the conflict over Moore has revealed their church home as just another example of the racism they have been fighting. Over many weeks, worshipers have been divided between those who will picket on Moore’s behalf in front of church meetings and those who will cross the picket line. Between who will sign a petition demanding Moore get a financial settlement that is “grounded more in our shared values” than in legal requirements and those who will not. And between those who think it’s not a coincidence that management complaints involving a white man and black woman ended with her exit - not his - and those who trust that it is. Both sides are now at a stalemate over Moore’s departure. Church leadership and Moore are trying to return to negotiations over her severance package as the congregation continues trying to square the perceptions of Moore’s treatment with its anti-racist self-image. “We preach justice here, but when it’s right in front of you, you don’t want to pay attention,” said Vickie Lindsey, an African American who is a former board member. The situation has become something of a Rorschach test for how congregants perceive the role of race, given the lack of details about Moore’s ouster. Support for Moore does not break down completely along racial lines, but at the basement meeting of 40 people on a recent Sunday, at least half of the participants were African American or of color. And the willingness of congregants to trust All Souls and the investigating institutions appears to be influenced by race, with some members of color saying they are disinclined to trust the process has been fair when they don’t know all the details. Even among congregants focused on getting Moore a strong severance package, there is a willingness to admit she had drawbacks. The issue, they say, is whether she as a black woman is being treated with equal consideration. Some say neither race nor gender played a role in the current conflict - and then pause. There’s a desire among many to go back to the way things were - but now it’s clear not everyone shares the same perspective on what that was.